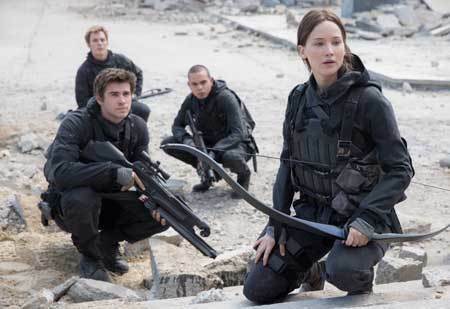 The Hunger Games: Mockingjay - Part 2 reveals the final fates of Katniss, Peeta, Gale and other loved characters bringing The Hunger Games film series to an end. 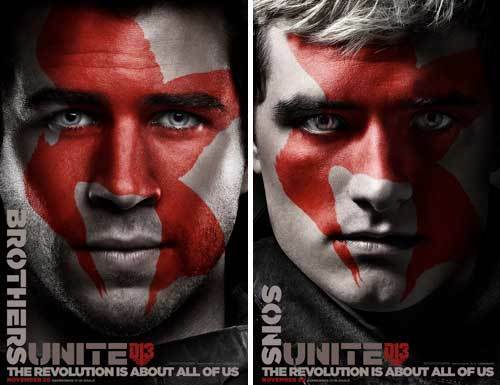 Young actors Jennifer Lawrence, Josh Hutcherson and Liam Hemsworth have practically grown up making the four films in the series and got serious with reporters about their life-changing roles, what they learned, difficult scenes in “Part 2” and more. Producer Nina Jacobson told press why she thinks these books and films struck an emotional chord with so many young readers and audience members. Nina: I think that it’s the notion of social change and the possibility of defiance in the face of injustice and kindness in the face of cruelty. I think the popularity of dystopic fiction speaks to an anxiety that young people feel about what awaits them. 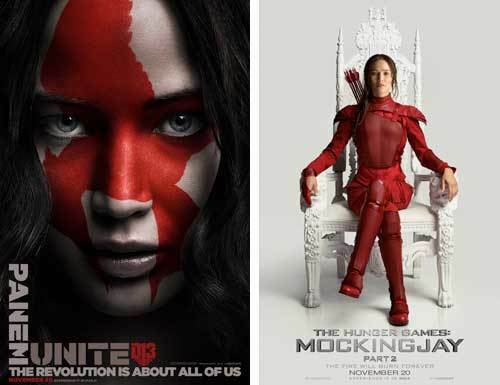 What I find so hopeful in these books and movies is the fact that you can create change. You can refuse to play the game and see your world change as a result. I think also it is the voice of young women being spokespersons for that kind of change. Young people, whether they're boys or girls, will rise to that occasion and change the world because we need to do that. WARNING: This interview contains story spoilers. 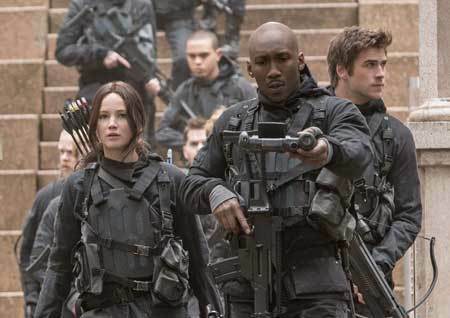 If you did not read the entire Mockingjay book and don’t know how the series ends, check back in with us after seeing the film. Q: Jennifer, could you talk about your last moments as Katniss, and for Josh, can you talk about how you did the great job of portraying the dual sides of Peeta? Jennifer: I feel like I kind of had two final endings with Katniss. First, the one when we wrapped the film in Berlin with everybody and that was kind of saying goodbye to the movie. Then I had a last scene about a year later with my nephews, which was so special. They played my children, so it was this amazing closure to this character whom I've loved for so many years, to have my blood family instead of this family. I got to say goodbye to both at different times. Josh: For me, it was cool. This was the final episode that I was looking forward to when I read the books where Peeta was hijacked and tortured and all those things. It was cool to take a character that has a special place for the fans that everybody loves so much, this golden boy, and to turn him to the dark side and kind of explore, that while also having the back and forth of being quasi-bipolar from all of the trauma that he's experienced. Q: Jennifer, could you talk about when you finally wrapped, did you feel like you'd already done all you could with the character or was it bittersweet that you were giving Katniss up? Jennifer: I think the feeling of accomplishment will happen more when the film finally comes out. We're not really done working on it. We still have to represent it. I didn't really feel like I said goodbye to her. That's what we do on every movie, we develop these characters, then a few months later we never see them again. I guess I'm used to that. I think it will be pretty bizarre when the movie's finally out and everything's officially done (including this press tour). I think that'll be a pretty weird feeling on a personal level because this movie's been my life for so many years. Q: The fighting in the sewer sequence was intense. Were your costumes at all waterproof? Josh: The costumes were not at all waterproof, and they had pockets that were just filled with water. 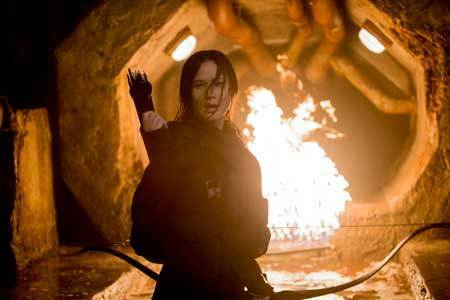 Jennifer: When we got to the fight sequence in the sewer….we're all here complaining and we were very lucky but all of our gear and all of our costumes were completely waterlogged. It felt like an extra 2000 pounds. It was hard. It was rough. Josh: At the end of that sequence I was just like, “Oh my God, we have more shots to do!”. That final room, it just seemed like it was just neverending. Q: Liam, do you feel a bit down or sad because you didn't get the girl at the end? What do you think about the evolution of your character? 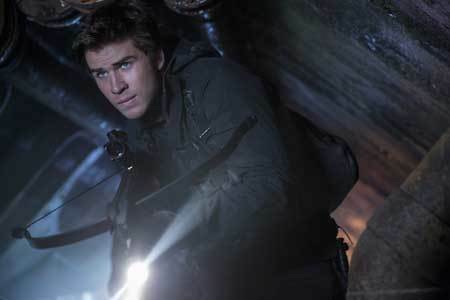 Gale has turned into somebody who is kind of coldhearted due to the war. Liam: I didn't feel down. I actually feel pretty happy. Obviously I'd read the books too so I knew it was going to happen at the end. He gets pretty angry at the end. For a long time he didn't really have any power to do anything. For this last part, he's front and center and is really able to make an impact and I think it all kind of goes to his head a little bit and he loses sight of his own morals and values. It's kind of why Gale and Katniss part ways I guess. They have a strong disagreement about what's right in war and that’s something that, in the end, Katniss can’t really let go. Q: The Hunger Games series is originally for young adults and a lot of them look up to you as people and your characters in the movie. What do you hope that young people will take away from the film? Josh: For me, a message that's always been pretty strong is standing up for what you believe in and how one person has the ability to affect something and one person can stand up and get behind a cause and fight for it. Those are pretty strong messages I hope that the fans take. I think that's why they connect with it in a way. It empowers them. That's what I hope people take away from it. That and the consequences of war, obviously. 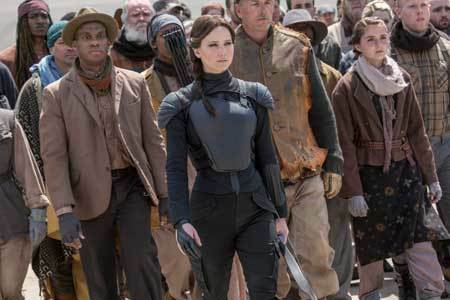 Katniss is a character who wants nothing more than to not have war, but unfortunately in the finale of the film, she realizes that’s where it’s headed and it has to be done in order to have the revolution. Q: Josh, in another lifetime, if they're remaking Mockingjay, what other part would you play that you maybe admire? Josh: I’ve always loved Haymitch but Woody’s perfect so I don’t know. Q: Jennifer, Katniss stops fighting and goes back to her hometown to raise a family and live in peace. Do you ever see yourself living that ordinary person’s lifestyle out of Hollywood? Jennifer: We all had to find a balance in feeling ordinary in our bizarre lives. We're all in a place where we weren't born. I don't really feel like escaping from anything when I finish a movie, I still like to stay in New York or LA. I enjoy working. There are certain things that I like to escape from in this business, but for the most part I don't really feel like going off into the country. If I went to some place quiet, I'd just lose my mind. I'm sure one day I will want to retire and slow down, but as of right now I love working, I love reading and writing and doing anything to keep myself busy. Q: Jennifer I know you recently wrote a letter about not making as much as your male costars. I wonder if you could talk a little about what prompted you to write that? Jennifer: I would love to straighten out that I wasn't writing about not making as much as my male costars, it wasn't so much about complaining, it was more about how my own mentality got in my own way of fighting just as hard as men to get a better deal. Is that because I'm a woman? (Studios) are not going to give somebody more money if they don't ask for it, no foul play from the men or anybody making the movie. A lot of things have to be rearranged and exceptions have to be made when you're going to have that many movie stars in one movie. I hoped to just write about how my own fears of how I'm going to be portrayed or how I'm going to look or how people will judge me got in my way when obviously the men in the movie don't think that way. Even after writing it, it's been called Jennifer Lawrence's bratty display. Thank you for completely making my point that when a woman speaks up and is assertive and has a voice, she's getting called a brat. I just don't see a man getting called a brat. Q: I don't think you're a brat at all. I was wondering if you could describe the trajectory and the ride you've been on in the last five years. You’ve made a lot of films. Jennifer: It's a hard thing to sum up. Honestly, it's a job. I really love acting. With the five years of ups and downs, there were a few years of getting used to it. Your entire world changes. Now it's very easy to get me because I'm isolated. I have a new normal now, so I feel very stable and normal and happy. It took a few years to get used to being looked at differently because it's a very alienating feeling. You don't feel different but everyone reacts to you differently. The pressure, you just can't think about it. It'll just keep me up. When I got used to it, then I got back to work. Q: For all of you, looking back, you've said this movie has been your life for years and years now, how do you think you've changed or grown professionally or personally over these past several years? Jennifer: It's probably too soon to look back and reflect. I hope I've grown up. It's much easier to be mature on sets without Josh and Liam. I'm sure I'm still unrecognizable to people I'm on set with. We've all helped each other get a handle on everything. Going off and not doing movies with them was like losing training wheels. Okay, I’m riding in the street and I can do it. 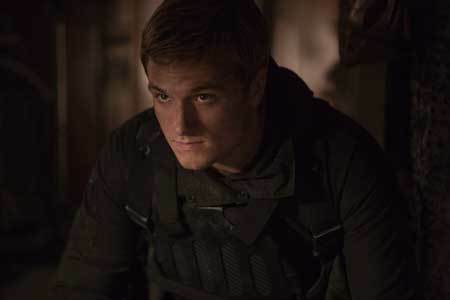 Josh: For me it's a hard question, whenever someone asks, “What have you learned?”, I'm constantly learning things just in life and experience, working with various actors and directors. I don' say “Okay, today I learned this”, I just kind of grow as a person. For me, it was like a college experience in many ways. I've learned many things, as an actor as a person, but to really say something specific, I don't know. Liam: I think getting used to your world constantly changing, and going from one extreme to the other over the past six years, I think it gets easier. At first, as a young person, doing something like this, going from one extreme situation to another is really overwhelming. Over years, you learn to let it go and not be so attached to having a routine or feeling safe at all. I think you just have to let go and just accept that you've just got to go with it. Jennifer: Yeah, because, with our jobs, it's so full on, you're working 13-16 hour days, every single day, in a strange city where you don't know your surroundings, don't know anyone. Then you wrap and have time off then you just go to nothing. Liam: …and become an alcoholic. Not me! I'm just talking about friends I know. Jennifer: It's hard to find a balance because you go from being overworked, “Oh my God, I’m so exhausted. Oh, my body!” then you get time off and your mind is going crazy. I hate waking up without a goal or going to sleep without achieving anything so now I just obsessively work and on weekends, meet with directors and pitch myself or write. Q: Did you have any pressure from the studio to portray the characters any differently after the first film was so successful? Josh: I don't think that the success impacts your depiction of the character. It's all in the books, your character's there, and you're going to play them how you see them. There was no pressure from the studio or anything like “You need to be funnier now that we’re making money”. Jennifer: We had to grow and change with our characters. 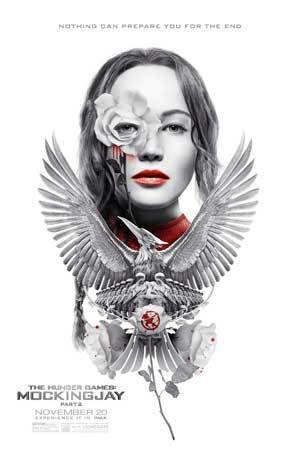 Q: Jennifer, in the movie, Katniss has become this household name that symbolizes courage and strength. To audience members today in present time, what do you think the name symbolizes? Jennifer: Hopefully the same ideals. Audiences are growing up with this character. I hope everybody is going to take away something different from each film as they get older. I hope that they take away the same thing as they always have, but also our audience will grow and learn more and see more of themselves or see more of what they want from this world or this country. Q: Regarding franchise films, we see how some actors struggle after a film series to see success. We haven't seen that with you because you just keep going and filming and your success is just blooming. Why do you think that is? Josh: She’s a d**n good actress! Jennifer: Thanks but I've been really fortunate. I shot the first Hunger Games movie, then I auditioned for Silver Linings after it wrapped so nobody had seen it yet. I was very aware of how overwhelming these movies and this character was. I want people to be able to lose themselves when they're watching and this character is remarkable and I think she's the greatest female character ever. I just tried to keep working so people could see other characters, other things that I could do, instead of me taking vacation time. Are you sad that his is the end of the Hunger Games film series? Did you ever get into the characters, actors or books? Check in with a comment!